A microinverter inverter converts the DC output from a single PV module into grid-compliant AC power and is meant to be located near the module. The Enphase Microinverter System simplifies design and installation by alleviating string-sizing constraints, and it optimizes the energy harvest of each module through independent maximum power point tracking (MPPT). An Enphase System consists of microinverters, Engage trunk cables (M215) the Envoy Communication Gateway, and the web-based Enlighten monitoring and analysis service. Through individualized MPPT, Enphase microinverters help realize the full energy potential of a PV array, mitigating the effects of shading, dust, debris, module mismatch, and thermal differences. With module-level-monitoring, performance issues can be traced to individual modules, expediting troubleshooting. Each PV module is connected directly to its own microinverter mounted on the racking underneath. The microinverter's AC wire harnesses are connected to form an AC branch circuit that leads to the AC utility distribution center. System safety is enhanced since all of the output wiring from the PV array is AC and no high-voltage DC is present once he AC power is shut down, removing that risk for maintenance personnel or firefighters. All Enphase Mincroinverter models are rated NEMA 6 and operate at full power in ambient temperatures from -40°C (-40°F) to 65°C (149°F), are Listed to UL 1741 for the U.S. and Canada, and comply with IEEE1547, FCC Part 15 Class B CAN/CSA-C22.2 NO. 0-91, .4-04, and 107.1-01. 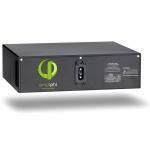 Enphase Microinverters with Canadian content are available by special order. The M215 microinverter is comopatible with most 60-cell PV modules (up to 260 W) and works with 208 VAC three-phase or 240 VAC sincle-phase services. The M215 has automatic voltage sensing, but be sure to order the correct trunk cable depending on teh type of utility service you're connecting to. 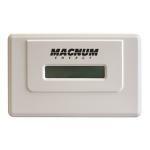 The maximum number of M215 microinverters in an AC branch circuit is 17 for 240 VAC single-phase systems and 25 for 208 VDC three-phase systems. Each AC branch circuit must be protected with a 20 A circuit breaker. The M215's AC circuit is made using ENgage Trunk Cables and accessories. 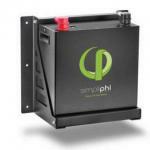 Be sure to verify that the voltage and current specifications of yor PV module match those of the M215 microinverter. For more information, refer to the Enphase website (www.enphase.com/support/downloads) for a list of electrically-compatible PV modules. To ensure mechanical compatibility, be sure to order the microinverter with teh correwct connector type for the PV module that you are using. The M215 Microinverters are covered by a 25-year limited warranty. The Engage Cable is a continuous length of 12 AWG (2.5 mm²), outdoor rated cable with integrated connectors for M215 microinverters. 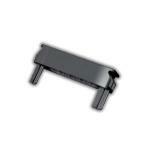 The connectors are pre-installed along the Engage Cable at intervals to accommodate PV module widths or lengths. The microinverters plug directly into the connectors, and the Engage Cable is terminated into a junction box that feeds electricity back to the system's AC disconnect. 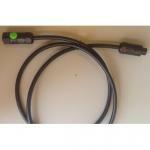 The Engage Cables are specific to portrait or landscape module orientation as well as 208 VAC or 240 VAC output. The gap between connectors on a portrait cable of either voltage is 40" (the approximate width of a typical 60-cell module). The landscape cable has a 67" connector spacing (approximate length of a standard 60-cell module). The cable can be cut to size. One end is wired directly into the junction box at the head of the branch circuit, without a separate AC interconnect cable. The other end is sealed from the environment using an Engage Branch Terminator. The M215 microinverter AC cable connectors are then plugged into the regularly-spaced Engage Cable connectors. 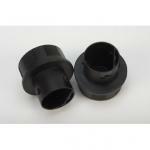 Any unused connectors must be protected with an Enphase waterproof Sealing Cap; the plastic dust covers on teh connectors at shipment are not weather-tight and cannot be used in place of a Sealing Cap. Engage Cables for both portrait and landscape installations are available in 40-connector lengths for 240 VAC single-phase, or in 30-connector lengths for 208 VAC three-phase systems, and include one Enphase Install Kit (4 Branch Terminators, 1 Cable Disconnect Tool, 5 Sealing Caps, and 100 wire clips). We also supply cable in 8, 12, and 16-connector lengths with Enphase install kits (1 Branch Terminator, 1 Cable Disconnect Tool, 1 Sealing Cap and Tool, and 20, 30, or 40 wire clips) for portrait-mode 240 VAC single-phase systems. 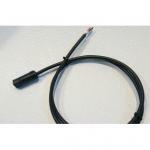 Both types of Engage Cables are also available, without an install kit, in bulk lengths with 240 connectors. This is useful for installer who plan to put in multiple M215 systems. The contents of the install kit can also be ordered individually. A Branch Terminator is used to seal the stub ends of each branch circuit. The terminator separates and insulates the individual conductors contained int eh Engage trucnk cable. One terminator is needed per branch circuit. NOTE:The terminator is intended for one-time use only. The latching mechanism will be damaged if the terminator is removed after installation. A watertight Sealing Cap is used to seal any unused trunk cable connectors to IP67 weatherproofing standards. Unused trunk cable connectors generally occur where the trunk cable transitions to another module row or needs to span a gap in the array. Stainless Steel Cable Clips are used to fasten Engage trunk cable to racking or to secure looped cabling. Available in packs of 100. The Disconnect Tool is required to safely disconnect the microinverter's AC output cable from the Engage connector. The tool is reusable, so one per job is usually sufficient. Enphase Energy's per-module monitoring technology is integrated into the Enphase Microinverter System, meaning there's no need for a bolt-on or standalone third-party monitoring tool. Every microinverter communicates with the Enphase Enlighten website to show you a physically accurate representation of your entire system and the performance of each PV module in real time. Data is monitored 24/7 and Enlighten will immediately notify you via email of any issues it detects. For example, Enlighten will notify you if an individual module is under performing compared to its neighboring modules. One Envoy communications gateway is required for monitoring on each installation of up to 250 inverters. A Line Communication Filter is required for installations with more than 250 inverters. The Enphase Envoy communications gateway plugs into any standard AC outlet and collects microinverter performance information over the existing power line. No additional wiring is required. By plugging the Ethernet cable of the Envoy into a broadband router, performance data is automatically transmitted to Enlighten using the site's existing internet connection, further simplifying installation. The Envoy comes with a 90-day free trial of Enlighten monitoring subscription. One-year and 5-year per-inverter subscriptions are available for continued monitoring. The Envoy is also the communications gateway for the Enphase Environ Smart Thermostat. CSA Listed to UL 60950. Environ is a smart thermostat device that integrates with the Enphase Enlighten website, allowing owners to simultaneously manage their solar system along with their heating and cooling system in a single web-based platform. Environ makes it easy to take control of energy usage and lets owners set or adjust their home temperature at anytime and from anywhere, using a web browser or smart phone, as well as directly with the thermostat device. Environ wirelessly connects to the Envoy Communions Gateway using the ZigBee communications protocol. The Envoy connects the Environ to the internet, allowing it to transmit and receive information from the Enlighten website.